Last month, I was invited to attend a masterclass at Vogue Café kitchen with Gary Robinson, the Director and Executive Chef of Conde Nast Restaurants. The masterclass was followed by dinner at Vogue Café. 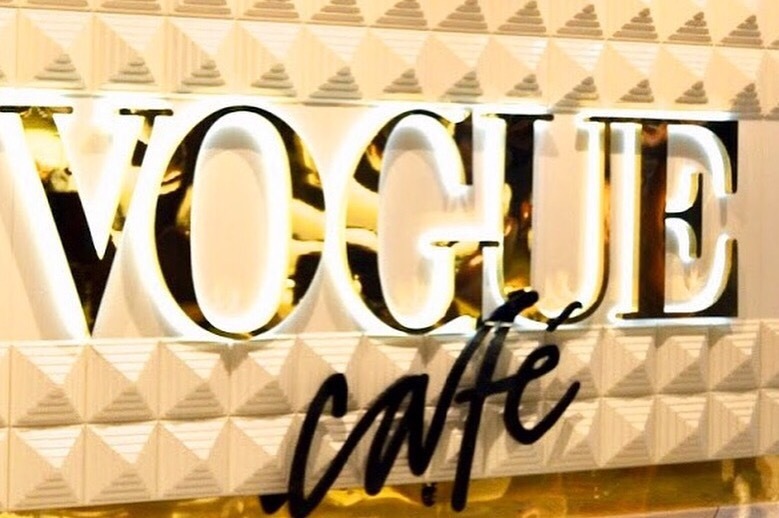 Vogue Café is located at the fashionable, Level Shoe District in The Dubai Mall. Vogue Café is a place where fashion meets food. The masterclass was held in the kitchen downstairs, as soon as I arrived at the cafe, I was taken to the kitchen by the staff. We were a small group of bloggers, 9 to be precise, and we formed 3 different groups, with 3 of us in each group. Each group learnt and made a dish. The first group made a Superfood Salad, the second one made the Stuffed Chicken and the third one made Chocolate Fondant cake. 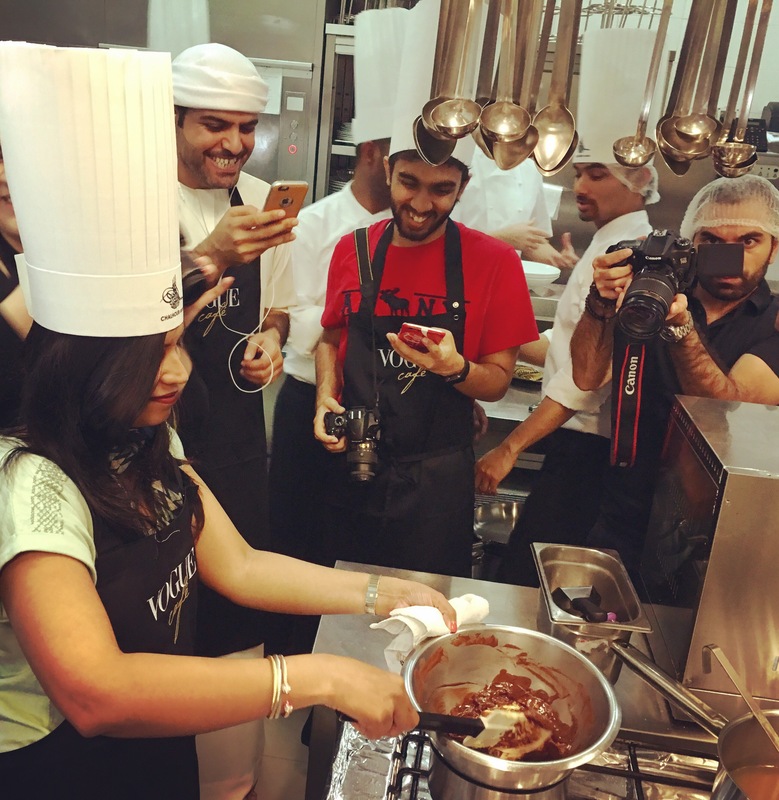 I was a part of group that learnt to make Chocolate Fondant. It was a great learning process as well as fun. I always thought it was tough to make chocolate fondant, but the chefs made it seem much easier. I would like to thank them for giving me enough confidence to try it at home. After everything was cooked, we moved back upstairs to the cafe for dinner with Gary Robinson and Farah Al Qaderi(founder and MD of Sadu PR)for company. We started the dinner with a round of drinks. I had the mocktail Sparkling Hugo. It was a fresh, light and fragrant mocktail. It is a perfect drink for the summer. We were served freshly baked bread with butter. Starters were served next. 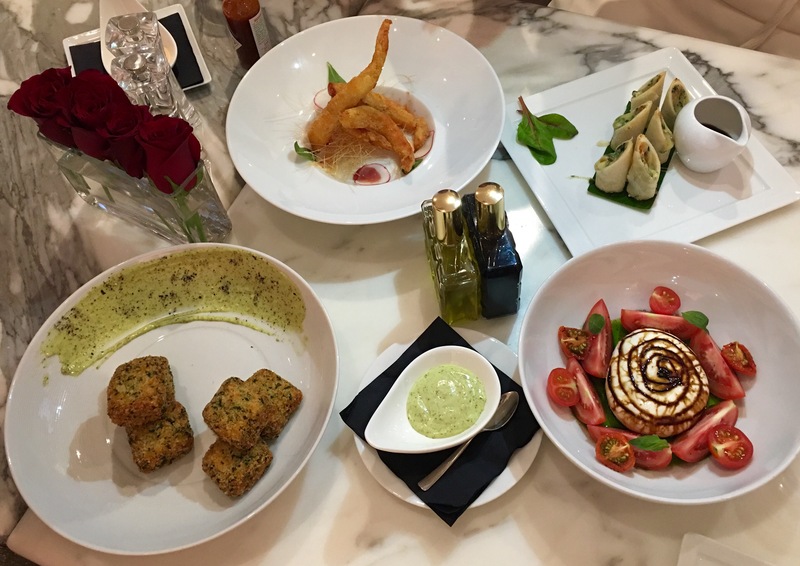 There was Portobello Mushroom Cubes, Italian Burrata, Spring rolls and Prawn tempura. Being a vegetarian, I could only try the vegetarian dishes. Portobello mushroom cubes and Burrata were outstanding. The portobello mushroom cubes was tender and tasty, stuffed with mushroom and coated with Parmesan Panko, truffle oil herbs and pesto mayo. The Italian Burrata was rich and creamy. It was served with plum tomato, fresh basil, basil oil and homemade balsamic reduction. While my blogger friends opted for Prawn curry and Chicken Duxelle for the main course, I had the Vegetarian Penne. 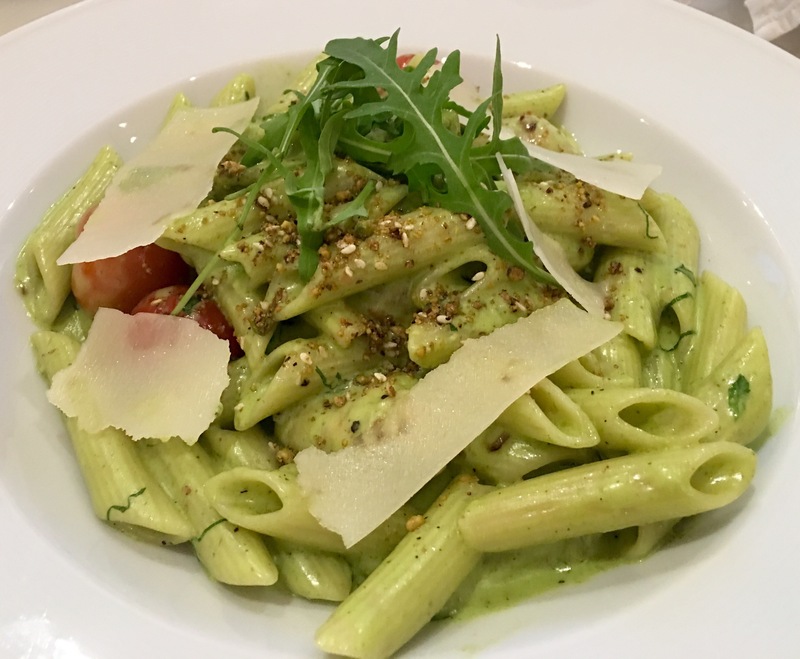 The Vegetarian Penne had a medley of veggies like asparagus, artichokes, tomatoes with rocket leaves and ricotta cheese in a creamy basil sauce. It was topped with dukkah spices. This dish had a beautiful light green color and it tasted terrific. A great main course option for the vegetarians. 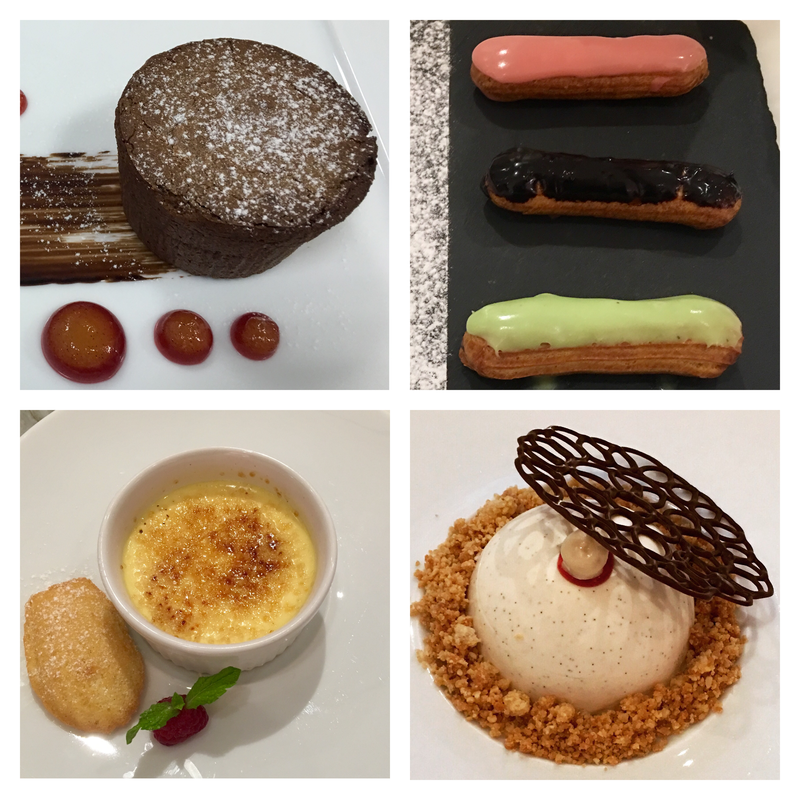 We sampled 4 of their amazing desserts-Chocolate Fondant, Eclair trilogy, Crème Brûlée and Panna Cotta. The chocolate fondant with vanilla ice cream was my favorite. It had a melt-in-your-mouth goodness to it. Eclair trilogy had three different flavors-Rose, Chocolate and Pistachio. Each one of them was unique and delicious in their own way. The Crème Brûlée was served with madeleine. Compared to the other desserts that were offered, I didn’t like this one. It was not extraordinary. The panna cotta with raspberry coulis and almond crumble was sweet, tangy and luscious. We ended our dinner with a hot beverage. 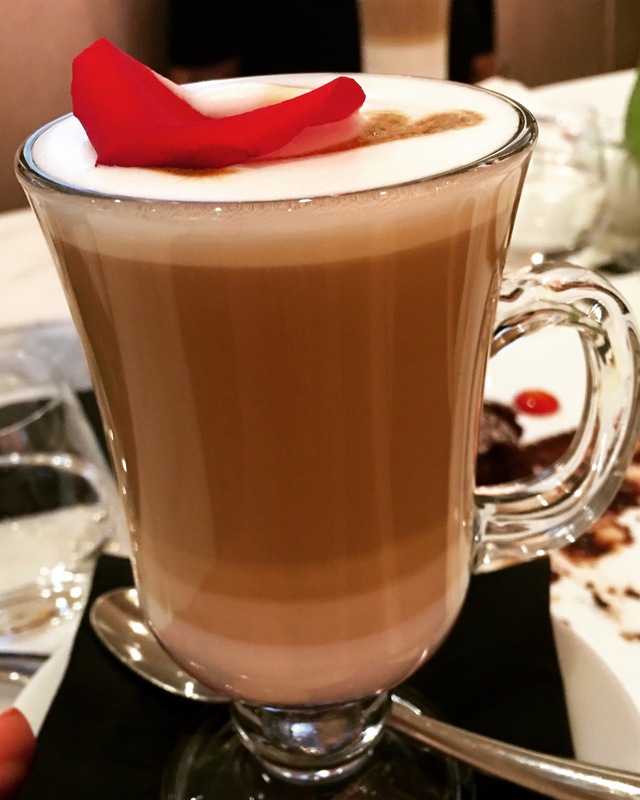 I ordered a Rose Latte. This gorgeous looking drink had different layers. It was a well balanced drink, with a subtle hint of rose flavor. Rose latte was fantastic. Overall, I had a great experience. The food, the service and the atmosphere was good. The masterclass was excellent, one of the best that I attended. Special thanks to Farah Al Qaderi, Gary Robinson and the team.